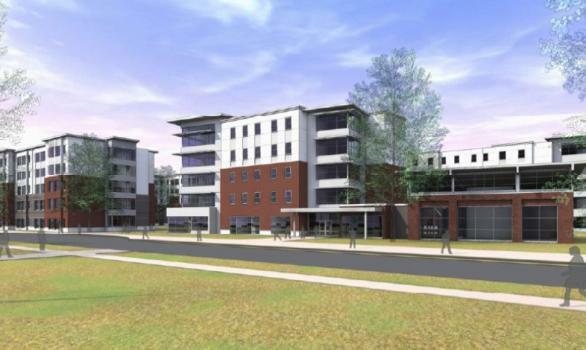 New student housing for Georgia Regents University will all go to the Health Sciences campus downtown while the Summerville campus and its surrounding historic neighborhood will remain largely untouched, at least as far as the exteriors go, GRU officials said Friday. The new cancer research building will be built above and across Laney-Walker Boulevard between the current cancer research building and the cancer clinic building, said Phil Howard, vice president of facilities service at GRU. And while there are no current plans for the former Golf and Gardens property on the Savannah River, outside of possible intramural sports fields, the university is open to proposals from potential partners, Howard and GRU Provost Gretchen Caughman said. The two spoke after a meeting on the Campus Master Plan that is an attempt to look out 10 years at what would be needed in the consolidated university in terms of new student housing, new research and new faculty facilities. It was done in conjunction with the University System of Georgia, whose approval is needed on new capital projects, and with Georgia Regents Health System. Detailed clinical planning, however, is somewhat on hold as officials wait to see what happens with the appeal of the health system’s 100-bed new hospital in Columbia County, which could include a health campus in the future, and with talks with University Hospital about a potential partnership, Howard said. “It’s just hard to do detailed scenario-building when there are so many variables in play,” Caughman added. Part of the plan now, however, is to identify areas on campus that should be reserved for possible future clinical growth, Howard said. What is more certain is the need for new student housing, all of which is planned for now for the Health Sciences campus, Howard sad. “There are multiple advantages to that,” he said. One, it makes it easier to build a campus community feel among the housing and helps create a more “robust” student union and student activities, Howard said. The university is also wary of changing the Summerville campus and the surrounding neighborhood, Caughman said. “We acknowledge and are very respectful of the historic nature of the Summerville campus, the beauty that it has there and the archeological significance of some of the land there and the surrounding neighborhood,” she said. But that also creates a heavy need for transportation back and forth. “In order to make this work, and we will succeed in it for our students, we have to have a very robust shuttle system,” Caughman said. The first phase of student housing will be 712 beds, 404 for undergraduates and 308 for graduate students, that will replace some existing student housing along 15th street, Howard said. That work will start once students leave in May and the housing should be ready for fall 2016, he said. The university will also need to expand food service nearby to support student dining and there will be a need to expand dining on the Summerville campus to support student meal plans during the day, Howard and Caughman said. With a projection of a little more than 11,000 students in 10 years, from its fall 2014 enrollment of 8,530, the university hopes to provide housing for about 26 percent of that on campus, likely up and down 15th on campus or across the street from the medical center, Howard said. Current student housing off Wrightsboro Road will eventually move to the Health Sciences campus, he said. The university will retain Christenberry Fieldhouse but likely reconfigure some of the surrounding fields to eventually support bringing back men’s and women’s soccer programs and adding women’s rowing, officials said. Part of that depends on enrollment growth and booster support, Caughman said. The proposed cancer research expansion will now connect the current clinical building on the corner of Laney-Walker and R.A. Dent boulevards with the cancer research building across the street over Laney-Walker, in much the same way that the health system’s Medical Office Building connects on multiple floors to Georgia Regents Medical Center over Harper Street, Howard said. The original plan had been to build it across 15th Street on the site of the Alumni Center but this will be cheaper and avoids duplicating core services, Caughman said. It will also give a building that can help in the university’s bid to become a National Cancer Institute-designated Cancer Center, Caughman said. What was not “programmed” in the process so far has been the former Golf and Gardens property, he said. That, along with the former Sears building site on Walton Way, however, could certainly attract some interest and the University is open to that, Howard said. What they might do in the meantime is create some intramural fields on the riverfront property, something they don’t really have the space for on the Health Sciences campus, Howard said. “It would be a wonderful way to bring the students downtown,” Caughman said. None of the planning so far has come with a pricetag and Howard said he expected to get the preliminary figures next month, which could also affect the priorities. The process is supposed to wrap up in May but will be fluid going forward as circumstances change, Caughman said. The new GRU president could also have an impact on the plans, she said. But GRU officials are enthused about what has happened so far, Caughman said. “You get excited about seeing the possibilities there and how we can begin to actually expand and grow the capabilities of this new university,” she said.